Partners’ cl ient Select Bag Sealers may be one of the UK’s undisputed experts in sealing bags, but recently they decided to turn the tables in the name of charity and get involved with saving seals. 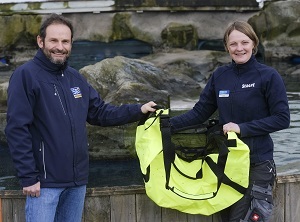 Thanks to a donation from Select Bag Sealers to SEA LIFE Scarborough, the seal sanctuary has been able to purchase a set of new seal transportation bags, which play a vital role in getting injured seals to the sanctuary for treatment. There’s nothing quite like a trip to the great British seaside, even in the rain, so we were pleased to get the chance to visit Scarborough with Select Bag Sealers’ managing director Simon Browning to meet the team at SEA LIFE Scarborough and see how the company’s donation is already being put to good use. SEA LIFE curator Lyndsey was o n hand to introduce us to some of the sanctuary’s current residents, as well as show us round the hospital where the injured seals are rehabilitated and explain how the bags will help in the rescue of injured seals along the Yorkshire coast. The centre is the only seal hospital in Yorkshire, taking in over 30 injured seals every year, and the new bags will play an important role in both rescues and eventual releases.